The SocketTools ActiveX Edition is a suite of ActiveX controls that enables you to add Internet functionality to your applications. SocketTools provides everything that you need to get started, including complete documentation and examples, along with free technical support to answer any development questions that you have. The SocketTools ActiveX Edition includes controls for uploading and downloading files, accessing web-based services, sending and retrieving e-mail messages, executing commands on remote servers, interactive terminal sessions and much more. The ActiveX controls are based on the Active Template Library (ATL) with no external dependencies on third-party libraries such as the Visual C++ runtime. They can be used with Visual Basic 6.0, Visual C++, dBase Plus and any other language that supports the Component Object Model (COM) and ActiveX standard. This also includes Visual Basic for Applications (VBA) in Microsoft Office, and scripting languages such as VBScript. For developers who are using Visual Basic 6.0 and Visual Basic.NET, the ActiveX controls can be used in both types of projects. With the SocketTools ActiveX Edition, you can leverage your existing code in new applications while maintaining your legacy software. And if you plan to move completely to the .NET platform, the ActiveX controls have similar properties, methods and events to our .NET classes, making the transition even easier. 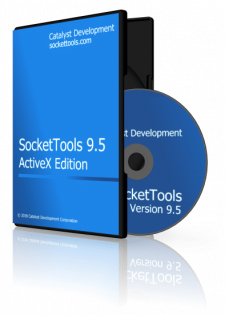 A SocketTools ActiveX Edition license includes free technical support by e-mail, and access to support resources such as our knowledge base and online help. Technical reference documentation and example programs are included with the product. If you have critical support needs, you can also purchase additional support with your license.